Ryōan-ji (jp: 竜安寺 or 龍安寺), «The Temple of the Peaceful Dragon» is a Zen temple located in northwest Kyoto, Japan. It is part of the «Historic Monuments of Ancient Kyoto», a UNESCO’s World Heritage Site. The temple belongs to the Myōshinji school of the Rinzai branch of Zen Buddhism. The site of the temple was originally a Fujiwara family estate. 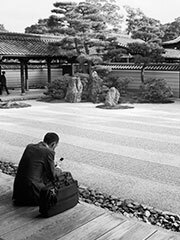 To many, the temple’s name is synonymous with the temple’s famous karesansui (dry landscape) rock garden, thought to have been built in the late 1400s. The garden consists of raked gravel and fifteen moss-covered boulders, which are placed so that, when looking at the garden from any angle (other than from above) only fourteen of the boulders are visible at one time. In an article published by the science journal Nature, Gert J. Van Tonder and Michael J. Lyons analyze the rock garden from the standpoint of visual perception. They use the medial axis transformation, a model of shape processing, to show that the empty space of the garden is implicitly structured, and is aligned with the temple’s architecture. According to Van Tonder and Lyons, one critical axis of symmetry passes close to the centre of the main hall, which is the traditionally preferred viewing point (they found that imposing a random perturbation of the locations of individual rock features destroys the special characteristics). They went on to propose that this feature contributes towards the visualappeal of the garden, and may be an intentional feature of the design. In the gentlemen’s restroom at the main temple, a window directly above the urinals provides a partial view of the famous rock garden. Many visitors have jokingly referred to this as the most contemplative view they have enjoyed during a soujourn to the watercloset.